Herb Wreath - Jill Ruth & Co. 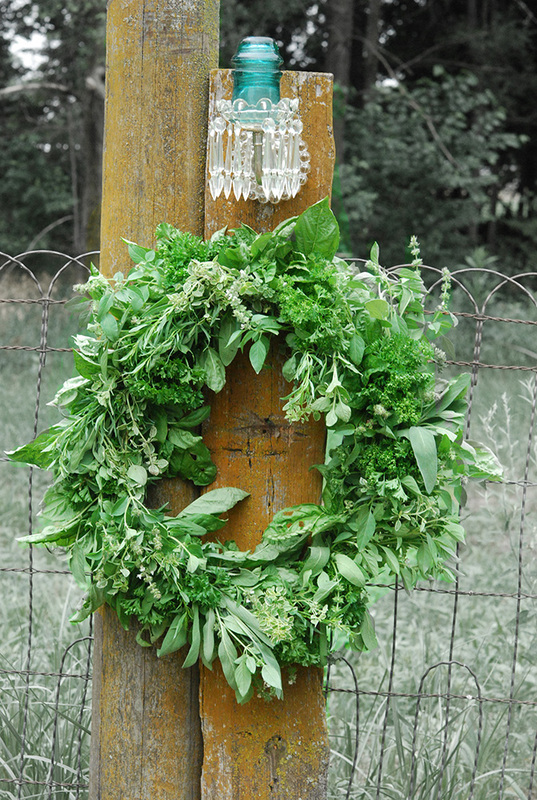 The herbs in the garden are growing well, so, I decided to try to make an herbal wreath to dry. 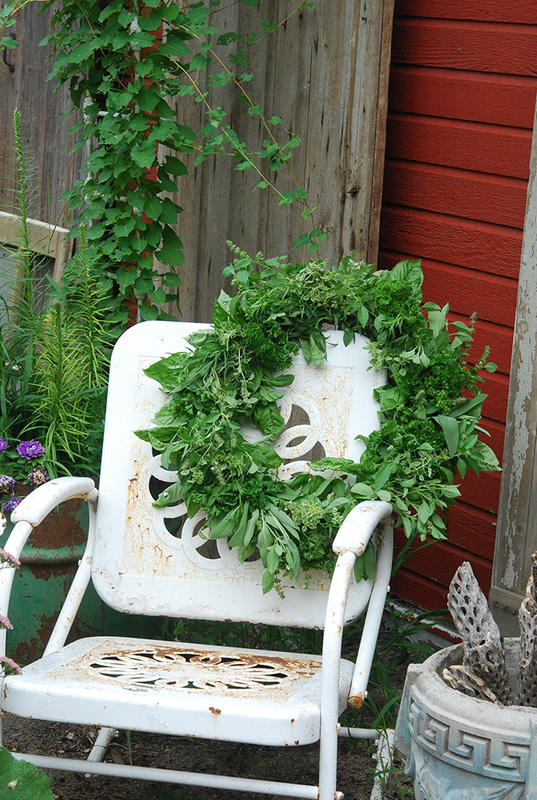 I wired the herb sprigs to an embroidery hoop for the base and then moved it around the garden for a photo shoot. Looks great under my little chandelier I added to the space! Oh, if it could stay looking like this and outside...but alas! We all know cut leaves droop. And, they say dry them out of the sun. If only, it could stay like this! The drooping set in strong about 20 minutes later. Now, if I can get it to dry nicely it will be beautiful again. The challenge will be let it dry with "nice looking droopiness". I currently have it hanging horizontally upside down in my laundry room. I think I need to add a few more wires. I'll let you know how it progresses. I showed my small 4-H club (four members, two are my girls) my herbs and we made herbal infused sparkling water to drink. I loved it, one of my girls liked it, but the other three girls didn't think too much of it. More on that pom pom garland and paper banner later! I hope you are having a very pleasant day! so lovely - and what was your method/recipe for the herb infused sparklking water? would love to know! I love this. 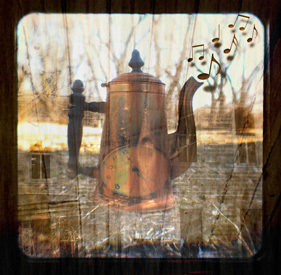 Even if it does droop a little with time...don't we all? This is so beautiful. And it will be still beautiful when it's dry. Be sure to show us! 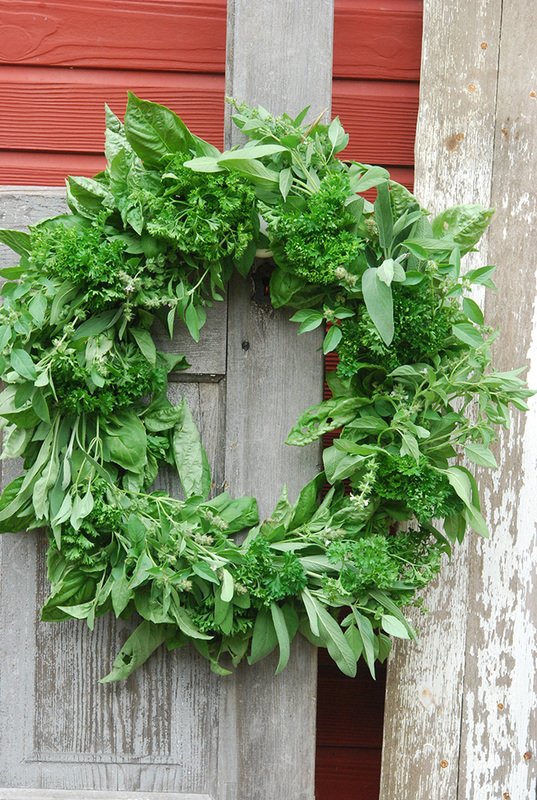 your herb wreath certainly looks beautiful everywhere you hang it...you have immortalized its fresh green beauty in your pretty pics Jill! That has to smell so good! I'm going to have to plant more herbs next year so I can copycat you. Seriously. This is GORGEOUS, Jill! I'll be so curious to see how well it dries. The photo shoot with this beauty is AWESOME! Gorgeous, gorgeous pics! The fresh green colors are contrasted so beautifully with the old barn red. I can only imagine how wonderful this must smell. I love squishing the leaves of herbs and rubbing them on my hands just so I can take the smell with me. Love the wreath. So beautiful. that little wreath must have made your house smell beautiful. 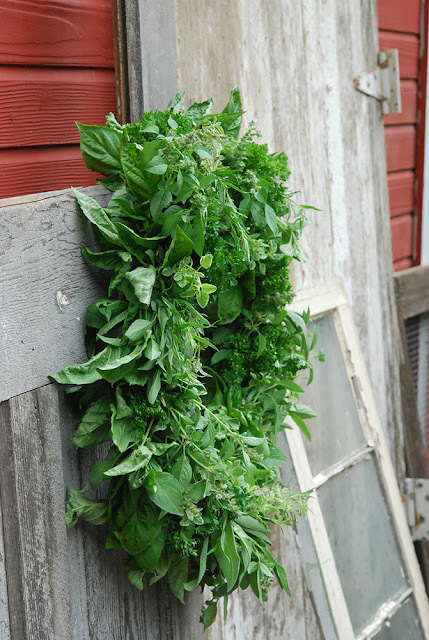 I love brushing up against the basil or rosemary outdoors, I carry the fragrance with me for a while. 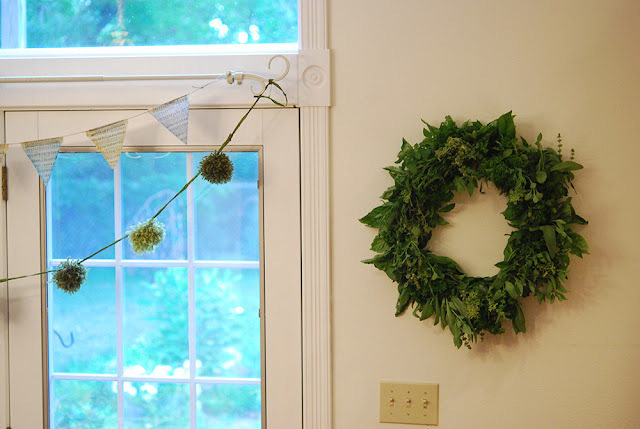 Would love to know more about your experience creating a dried herb wreath, I've never tried.